The Tennessee Titans were a schizophrenic bunch in 2009 after coming off a 2008 season that saw them with the best regular season record in the NFL. The team started 0-5 last season, which was bad enough, but in Week 6 things reached complete rock bottom. The Patriots won 59-0 in the snow at Foxborough in one of the most embarrassing moments in Titans/Oilers history. New England’s Tom Brady threw five touchdowns passes in one quarter and the Pats built the biggest halftime lead in league history, 45-0. The 59-point margin matched the largest since the NFL-AFL merger in 1970. It was the largest shutout in the NFL since 1976. And it was the Titans franchise’s worst loss since it began play in 1960 as the Houston Oilers, eclipsing the 61-7 setback to Cincinnati in 1989. After that game, people started to wonder if Jeff Fisher, the NFL’s longest-tenured coach, would be fired. 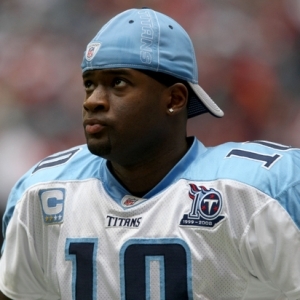 But one good thing did happen in that Pats loss: Tennessee starting QB Kerry Collins was 2-for-12 for minus-7 yards, and that effectively ended his\time as the team’s starter and basically forced Fisher – with a little public prodding from owner Bud Adams – to turn back to former Rookie of the Year Vince Young. And amazingly, the Titans turned back into a playoff-caliber team. They would win the next five games, with Young not putting up great stats (other than a dramatic comeback win against the Cardinals) but basically handing off to Chris Johnson, who finished the season with 11 consecutive 100-yard rushing games on the way to being the sixth member of the 2,000-yards-in-a-season club. Tennessee even had playoff hopes before getting walloped by San Diego in Week 16, but an 8-2 record after that start brought hope for 2010. Clearly Johnson will be the focal point of the offense again, with CJ saying he wants to hit 2,500 yards rushing. Again Young will be asked to simply manage the game and not make mistakes, but he’ll have to stretch the field once in a while. Kenny Britt was one of two rookie wide receivers to lead his team in receiving yardage in 2009 (with 701 yards on 42 catches) and should emerge as the No. 1 guy this year. The defense was atrocious against the pass last year and the Titans let end Kyle Vanden Bosch and linebacker Keith Bulluck go as free agents. They are hoping first-round pick Derrick Morgan can replace Vanden Bosch’s pass-rush skills. But there are many questions on this side of the ball and it could be the team’s downfall. If you believe in schedule strength, it’s not good news for Tennessee backers: this is tied as the toughest schedule in the league with an opponents’ 2009 winning percentage of .547 (140-116). Yet despite that there are only five games against playoffs teams so maybe that’s misleading. Frankly, there’s no reason this team should start any worse than 3-1. The Titans are 6.5-point favorites in Week 1 against Oakland and also will be favored in home games against the Steelers (remember, no Ben Roethlisberger) and Broncos. Last year the team opened with four of six on the road, so things set up much better for a different start in 2010. Then things get emphatically tougher with four of the next five on the road. And the lone home game has Tennessee on a short week against the Eagles. Oddly, the Titans have a nine-game winning streak against the NFC heading into the 2010 season, but I assure you that ends at some point this year. The Chargers made Young look really bad last year, as VY threw two interceptions and lost a fumble on his way to an 11.9 passer rating. Then after a very winnable home game against the Redskins, the Titans’ play five of their final six against AFC South foes. That’s pretty unusual to have them all bunched like that. Tennessee finishes at Indy for the third time in four years but that game hasn’t tended to matter because playoff positions had been locked up. If the Titans do start 3-1 I believe they can squeak by the 8.5 wins and finish 9-7. But the defense has too many questions and Young is still too erratic. Look for probably another 8-8 or maybe 7-9 so take the ‘under’.